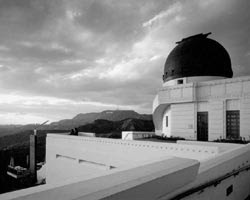 Friends of the Observatory (FOTO) is a non-profit membership based organization in support of the Griffith Observatory here in Los Angeles. One of the important benefits of FOTO membership is attendance for the many superb lectures organized by the group. I’ve been a member of FOTO for years. I was fortunate to attend a fascinating lecture Wednesday evening, June 3, 2009 called “Beyond the Hubble: The Next Space Telescopes” by Dr Alan Dressler of the Carnegie Observatories. Dr. Dressler is very recognizable from the Nova television series where he’s been a guest many times. I arrived early to grab a bite at the Observatory’s “Café at the End of the Universe” named after Douglas Adam’s novel. As I was munching down a Wolfgang Puck sandwich, I overheard the conversation at a large table of FOTO enthusiasts chatting it up while having dinner. The discussion was quite animated, moving from time dilation effects of travelling at the speed of light, to exoplanet discovery, to being physics groupies! Of course my ears perked up at this mention. One woman recounted her visit to Pie ‘N Burger near Caltech when to her surprise, noted Caltech physicist Kip Thorne walked in. She told her friends how she was all giddy and acted as if he were a rock star like Elvis or someone of that stature. Excellent! After dinner I made my way over to the Leonard Nimoy Event Horizon Theater where the lecture was to be held. The hi-tech multi-media theater seats 200 people and the place was packed. I enjoyed seeing so many people from the community out on a weeknight for science. The lecture was timely and informative. Dr. Dressler focused on how the Hubble Space Telescope (HST) has had astonishing impact on a very wide range or astronomical research, including life histories of stars, the evolution of galaxies, cosmology, dark matter, and dark energy. He then reviewed the achievements of the other member of NASA’s “Great observatories” program, including the Spitzer, Chandra, and Fermi space telescopes which have collectively extended human sight not just in space and time but also outside of the visible spectrum. These telescopes have revealed exotic events in our universe that were not dreamed of a century ago. With an eye to the future, Dr. Dressler also highlighted the role of the new James Web Space Telescope (JWST) that will launch into space in 2014. The JWST will take over where Hubble left off. Primarily an infrared instrument, JWST will also have some capability in the visible light range. JWST will have a 6.5 meter mirror compared to Hubble’s 2.4 meter primary mirror. If you live in L.A., you should definitely consider treating yourself to the Griffith Observatory as a science resource for the entire family. You might also consider joining FOTO. For readers outside the L.A. area, I recommend that you seek out any “Friends of” organizations associated with your local observatory, museum, amateur astronomers group, etc. Please report back here with information about your group.